A few posts back we saw how elimination reactions are often in competition with substitution reactions. ow do we know when one reaction pathway is going to be preferred over another? As we’ll see, there are going to be several components to answering this question fully, but today we’ll talk about one simple rule of thumb going forward. All else being equal, higher temperatures will lead to an increase in the amount of elimination products versus substitution products. The rest of this post is about why. Let’s say you have a reaction like this one. It’s possible for substitution or elimination products to be formed. [I’m keeping the identity of the base, substrate vague here since I don’t have a concrete experimental example to provide (although I’d greatly appreciate one)]. As temperature is increased, the relative amount of elimination products will increase relative to substitution products. You can imagine it looking like this. Notice again how organic chemistry works. It’s not as if applying heat is an on/off switch that results in a reaction going from 100% substitution to 100% elimination. Instead, increasing temperature results in a gradual increase in elimination products relative to substitution. That’s because temperature is gradually leading to an increase in the rate constant for elimination versus rate constant for substitution. Here’s one thing we can say with confidence: at low temperatures, the activation energy for the substitution reaction is lower than that for the elimination reaction. Remember that the lower the activation energy, the higher the rate of the reaction. This might help to explain our product distribution: as we increase the temperature, more energy is available, so so that the starting materials can ascend the activation barrier to provide elimination reactions also. This fits with what is observed. However, there’s an even more fundamental reason why we might see more elimination products as heat is increased, and it has to do with some properties we know about thermodynamics that make rate constants (and activation energies) temperature dependent. What do we notice here? 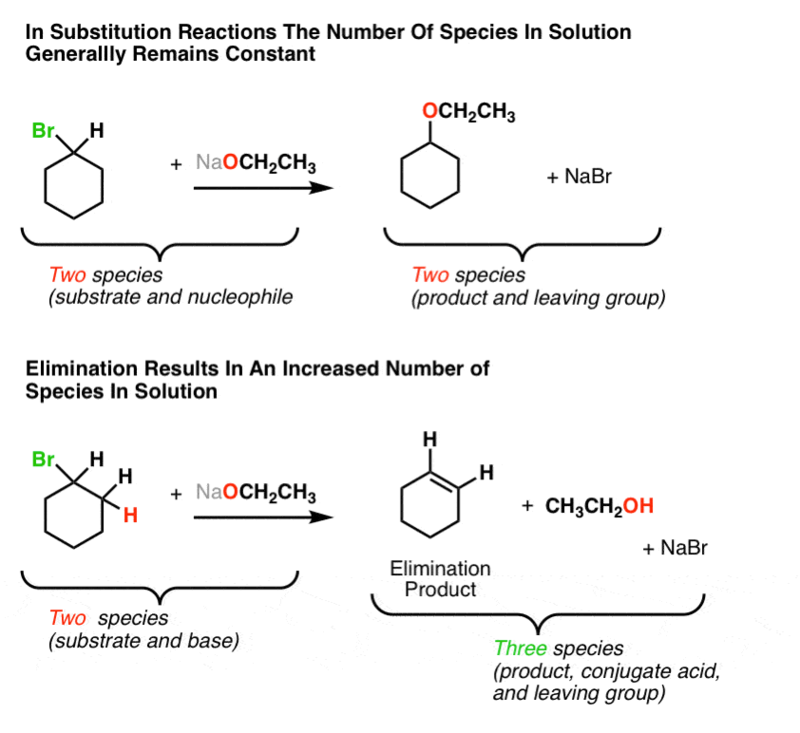 Notice that the substitution reaction we’re going from 2 species in the starting material to 2 species in the product. But in the elimination reaction, we’re going from 2 species in the starting material to 3 species in the product. An increase! Remember that the more negative ΔG is, the more favorable the reaction. As temperature incresaes, that TΔS term is going to start getting bigger and bigger; this will make Δ G more and more negative. At some point, as temperature is increased, the ΔG for elimination will become more negative than delta G for substitution. In other words, more favorable. One thing to be careful about though! When we’re discussing ΔG, we really should be talking about the ΔG of the transition state, not that of the final product. [Why not? Because the stability of products isn’t related to reaction rate (if it was, our bodies would have combusted to CO2 and H2O a long time ago!)]. We give a special designation to thermodynamic terms of the transition state – we put a little double-dagger on them. Like this: ΔG‡ . This “Gibbs energy of activation” is how we define the activation energy of a reaction. So you can see by analyzing this term that activation energy can change with temperature! At low temperatures, the Gibbs energy of activation for substitution (ΔG‡) is lower in energy (more negative) than that for elimination. But at high temperatures, the Gibbs energy of activation ( ΔG‡ ) for elimination starts to be lower in energy than that for substitution reactions, and hence we get an increase in the amount of elimination product. Again, the bottom line is that, all else being equal, heat will tend to favor elimination reactions. Hello! Thank you for posting such a great explanative article. I have an inquiry, however, about one statement you made. You said that an increase in temperature lowers the activation energy. I thought that temperature doesn’t actually lower activation energy, rather it increases the collision frequency and energy factors of the Arrhenius equation and, in doing so, increases the rate. I thought the only thing that actually lowers the activation energy is a catalyst. Excellent point. You are correct, I will fix this. Hm, I’m confued. Maybe it is because the text focuses on DeltaG for the reaction when it actually is all about the DeltaG‡? There are, as I can see, some fundamental differences, like the fact that whereas DeltaS~0 for the substituation and DeltaS>0 for the elimination, DeltaS‡ is *negative* for both the reactions. That would mean that DeltaG‡ actually gets *more posive* when the temperatre is raised, which would slow down both reactions. But that is not what we see experimentally. How can we make sense of this? Also, If we want to explain the observation that heat favours elimination, I guess we have to show that DeltaS‡ is *less negative* for elimination than for substitution. Can we be sure that that is the case, just by comparing DeltaS for the two reactions and noting that it is more positve for elimination? I’m not entierly convinced. Maybe you can help me out? I get the part about elimination being more entropically favorable due to the increase in product species amount, but if you say that we should only consider the ΔG of the transition state don’t they both form only one “transition species”? Why should this entropy reasoning apply to the transition state? **What I’m trying to ask is if we should only consider the activation energy of the transition state (as opposed to the products), why does the article mainly covers the ΔG of the products?